Reena Ahluwalia is a Toronto-based, multiple award-winning jewellery designer. Winner of the De Beers Diamonds International Awards and the Rio Tinto Diamonds Global Design Competition. She has been recognised as one of the Top 25 Masters of Jewelry Design in Canada. Along with creating jewellery, Reena is a strategy adviser and design consultant to some of the top diamond and jewellery houses worldwide. She is a passionate educator, teaching a course in jewellery design and fabrication, a speaker, a multi-disciplinarian artist, a painter and a community builder. Her diamond jewellery was featured on a special edition Belgian Postage stamp. Alexander McQueen featured Reena’s award-winning diamond piece in his S/S 2000 collection debut in New York. Commissioned by the Legislative Assembly of Ontario, Canada, she designed a diamond setting for the first two diamonds mined in Ontario, set in the historic Mace of Ontario. She designed a Diamond Tiara for Kate Middleton, a tribute to the British royal wedding, using Royal Asscher cut diamonds. She designed a collection with the very first diamonds of Rio Tinto's Bunder Mine in India. How do we encourage people to express what diamonds mean to them in today’s cultural context? There is an art in doing that. The diamond industry is already asking the right questions. Yet, we need to get a bit more creative. In a recent blog, Alex Popov points to the commoditisation of diamonds and suggests: “Why not bring the diamond back where it belongs — to the world of art?” Ayalla Joseph and Mark Boston both spoke of the relevance of self-expression. Diamonds owe more to desires than to basic necessities of life. Having worked with diamonds my whole career, I believe they get their real story, romance and symbolism when people attach their personal meaning to it. Diamond as a commodity may not deliver on that promising idea. Diamond as an art form may have a longer life span. As I share my thinking with you, consider my thinking as a brick in a building. By building I mean, the internal conversations we are already having as an industry on the need for generic marketing, of rough-polished prices, of perceived value, the diamond’s identity and desirability, the retention of its position, diamonds being coveted as carriers of emotions, markers and reminders of precious moments, of self-expression and affirmation. As noted by all industry stakeholders, I support calls for an industry-wide generic marketing campaign directed toward the consumer to promote consumer confidence and demand. The sooner we get to it the better. My thinking is simply this: To make headway, we need to harness the outside-in thinking that augments our inside-out thinking. For a long-term success, one way is to collectively work towards building a multi-layered sphere of positive influence outside our industry core. To try participating in external factors that otherwise have been beyond the reach and scope of our traditional industry thinking. A good example is the growth of the online gaming industry that may hit $20-30 billion in revenue by the end of 2015. Some of the reasons for its success are that it’s adaptive, disruptive and makes people and communities co-create messages and solutions. Another great example is LEGO Ideas, a portal through which users, including children can directly pitch product ideas to the company. We need to facilitate and help connect people, ideas and communities, Vinod’s example of Ferrari’s expansive brand ecosystem and auto racing is a good one. We need to garner high level of participation and interest in the metaphoric qualities of diamonds, qualities that makes diamond, a diamond. Support people and communities to be co-creators and collaborators in re-examining the role of diamonds in today’s cultural context. With that learning can we shape the diamond industry of tomorrow? By curating end-user collective intelligence across different disciplines and mediums, we may generate conversations around diamonds to make the industry gain a new vision of how we want to tell diamond stories of the future. This will help engage people in new and divergent ways. Here is how I am doing it. It all started off when one of my clients walked in to my studio and discovered my diamond paintings. I have been painting for many years, but privately. We were working on an exceptional diamond suite for a very important customer. My diamond client requested that I make a diamond painting as well of the diamonds I was using to narrate my design story — and boom! The value increased. We effectively raised the diamonds into an art form. According to him, what worked was my design provenance, and a signed painting by me that will retain value over time. So the medium of painting is an example of an outside-in thinking, of using a different medium of influence. After all, art is profound. It stirs emotions, makes us think deeper and touches our soul. 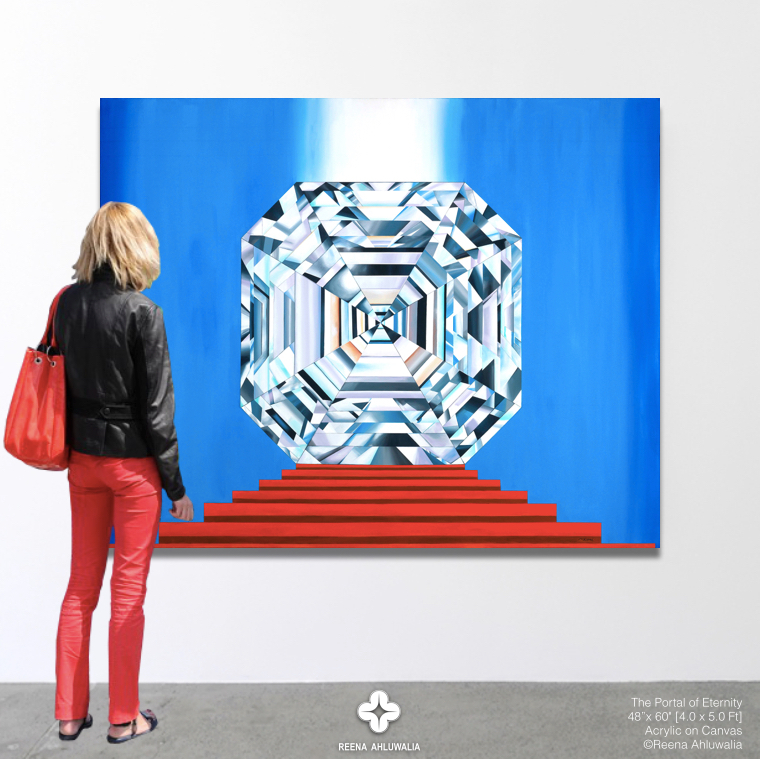 Here are some of my diamond paintings, in which I am connecting diamonds with narratives. 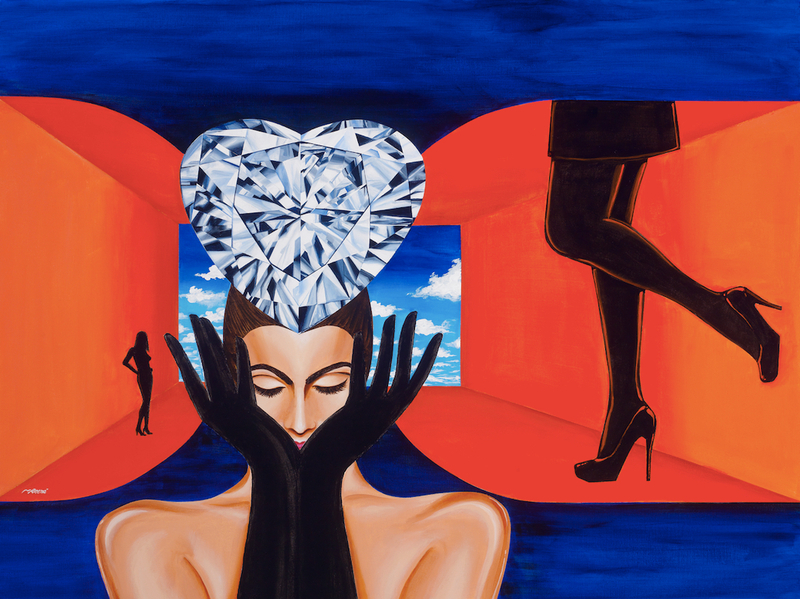 In my paintings diamonds are part of a larger story, always metaphoric and symbolic. Diamonds are not specimens; they have a soul and story. That’s what makes a diamond, a diamond!